Anamnesis City Spa offers comfortable, air-conditioned rooms with panoramic views of Fira Town and the east coast of Santorini. The Anamnesis is well integrated into its environment. It offers a good value for money. Additional guests can not be accommodated in this room type. 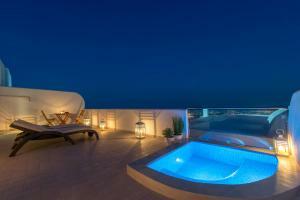 This spacious room features a private balcony with views of the Aegean Sea and the coast. It has air conditioning, a TV, free WiFi and a private bathroom with a hairdryer. 2 room flats with a staircase. This suite is soundproofed and features air conditioning and a balcony. This accommodation has a staircase to communicate your 2 plants. 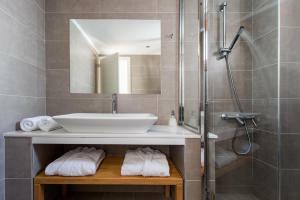 This deluxe double room has a private spa bath and views of the sea.